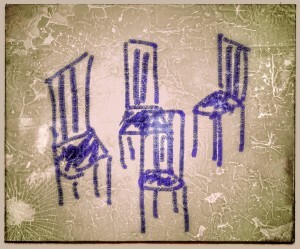 I feel so strongly about the legitimacy, inconceivable as it might seem, of my occupation of the fourth chair. That the Living God has extended the invitation, legitimizes my entrance. It’s absurd to believe I could have earned or merited the invitation. I know what I deserve. Yet God, out of His love for those whom He created, woos, entreats, pursues and for the time being allows the invitation to remain open-ended. There is a shelf-life to this invite but we don’t know what it is (another conversation). Two things leap out for me as I visualize myself having entered the dialogue. Both have to do with the personal nature of Gods pursuit, so that as I begin to understand the rightness of being in His company, I find a depth of intimacy with Him I have never experienced. First, I bear the image of God. I am His image-bearer, created by Him to reflect something unique about His nature. It’s vital to note that God does not make assembly line people, each just like the other. Every human is custom designed, a piece of art revealing an aspect of the artist unlike any other piece. So it follows that I bear His image unique to any other who has ever been or ever will be created. That makes me immeasurably valuable. Whether or not other humans recognize that value is not ultimately important. But I begin to get a glimpse into why God might pursue me with the tenacity He does. He likes what He makes. He loves who He makes! Not incidentally, image-bearing is common to non-christian and Christian alike. Without exception, every person who walks the earth bears the image of their Maker. When you remember that, you see people very differently. You look for the image. You look for the stamp. You look for what it is you can learn about God within the design of the people He creates. It’s a revolutionary lens that makes every person, friend or foe, intrinsically important. As I sit in the company of my Creator, I am struck by how highly personal the encounter is. It makes sense that I’m there. It makes sense that He cares I’m there. He is in fellowship with one of His works of art. The second bit that makes the experience of being in the fourth chair so profound has to do with sonship. I am not only an image bearer, I am His daughter. In fact, I am not just His daughter, but am connected to Him in all manner of other ways. I’m friend, heir, bride, etc.. The point is, I am family. As I enter the dialogue, I enter into communion with Father, Son and Spirit, with whom I am eternally bound, with whom I share spiritual DNA as a new creation in Christ. In a word, I am home. I am where I belong. I am where I was designed to be. I’m where I am known, accepted, championed, delighted in, and I’m where I am fully and completely loved. Entering the dialogue offers the definitive expression of freedom and wholeness. To leave His company is to head directly away from sanctuary. To choose to leave home is to invite peril. But to stay is to experience living as I was designed to live, in fellowship with the One who made me. I sit in communion with God. It’s vital, active and reciprocal, and it’s where I belong. I now enter into prayer and communion with a picture of 4 chairs in my mind...I love your heart for Jesus and that you continue to use the gifts he has clearly given you in providing valuable insight for my (our) personal growth and development in Christ Jesus. Anne, I can't state it as eloquently as you do but.... To talk with kings, queens and those in authority, an appointment is needed. We must get past all the handlers, assistants, schedulers, levels of authority before we can even set up a time to meet, and we may not even be able to accomplish that much. With our Father and our Lord, we enter right in to uninterrupted conversation at any time and any place. He is ever accessible to us and gives us His full attention. We don't hear, "I'll get back to you, I need to take care of something more important than my time with you." Our God, the creator of the universe, deems nothing of greater importance than his love for us and fellowship with us. There is no greater love; there is no greater acceptance for who we are in Him. Regardless of what anyone else thinks of us, He is the everlasting lover of our souls.